On Sunday, at (surprise surprise) a vide grenier, I picked up an old Hewlett Packard printer for a couple of euros. 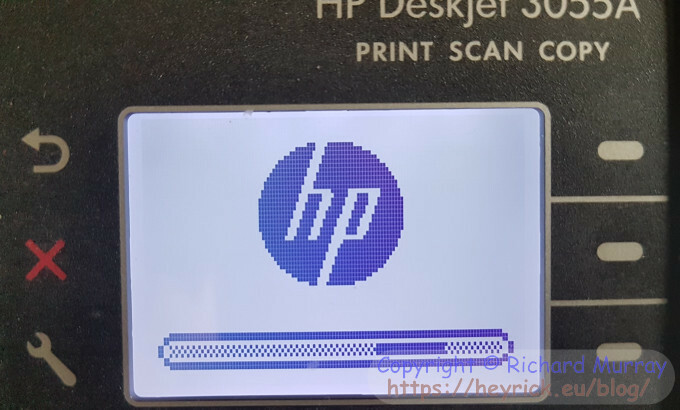 It's basically an older version of my current HP printer, what with "ePrint" (no longer supported, the system isn't up to running the latest more secure firmware) and "WiFi printing". I thought I'd get it for basically pulling apart to see what's inside. The display isn't touch sensitive or anything fancy. Beside the text are buttons. The display itself looks to be around 128×64, though I've not counted the pixels. Copy is for making copies directly on the printer. Interestingly, since this printer has a display, it offers additional features such as resizing and contrast/brightness control for direct copies. Quick Forms is interesting. You can print stuff like graph paper or music staves, week planners and checklists, or maze games and sudoku grills. Interestingly, the cartridges are identical in size and layout (right down to the dots that make electrical contact) to the ones in my current HP printer. The difference is in the number - this one takes 301 type cartridges, while my current HP takes 302 type. So I popped an old 302 into it, and it immediately threw up an error - a shorter worded version of "how DARE you use incorrect cartridges you miserable peon". It probably would have said that, had the display been able to fit more words. The other buttons. Upper left is for going back in the menus. The middle left (hard to see) is a red X to cancel whatever is happening. And the spanner is for settings. Down below, you can just see it in the first picture, are two more buttons. The left one is for WiFi settings, and the right one is for ePrint - but as I said the ePrint no longer works, so it just keeps reporting that it can't connect to the internet. Configuring the printer wasn't too hard. Turn the printer on, let it start up, then print out the WiFi status from the front panel. This will tell you the SSID of the printer and what IP address it thinks it is. So I told my phone to connect to the printer, and entered its IP address into FireFox. This brought up a fairly basic menu, but it was enough to et the thing configured. The WiFi wizard was useless. Starting it caused it to scan for access points (and in the process its own access point vanished). I went to the advanced setup and entered the SSID and passphrase of my Livebox in there, then told the printer to reboot. That was sufficient. I should point out at this point that the printer is not fast. Well, maybe it can blast out a dozen pages a minute (hah, unlikely) but the UI is tediously slow. You see that "busy" bar at the bottom of the screen in the first picture? You see that a LOT. Resetting the printer to factory defaults took something like forty seconds! The printer only supports IPv4 (cough, like RISC OS and the consumer Livebox, cough) and it supports Port 9100, SLP, Bonjour, Microsoft Web Services discovery/print, and IPP. Printing can be performed by WiFi or by a computer attached via USB. The printer has output 2840 pages, with 16 being borderless. 2955 were printed on plain papge, and "-151" (that's what the web UI says!) printed to "other" paper., all of them A4 size. Perhaps more worrying is that it has has 12 black cartridges and 9 colour ones. Simple division shows a black cartridge averaging 246 pages, which is about par I think. The colour would score better, but on the other hand not every page (or every part of every page) needs colour. Amazon quotes the RRP of a dual pack of 301 colour/black as being €31,99. So let's just say they bought ten of these - that means those two thousand pages cost about €320. If they got the cartridges individually as required. My God, I don't want to think about that... Makes my fiver a month for a hundred pages seem less insane (it would take 30 months, and cost around €150!). Anyway, enough of this. It works. Great. Now let's break it. There are two screws in the top cover on the right. They're weird little star-hex things, so you'll need a weird little screwdriver head that looks like an asterisk. Given my propensity for opening stuff up, I had just such a thing handy. Makes me wonder why manufacturers bother using freaky screws. There are two on the left of the cover as well, but to get to those you'll need to take the part with the display off. Wedge a flat blade under it somewhere and nudge it up, it's just a clip-together. Don't get too enthusiastic though, the display panel connects to the motherboard by way of a flimsy looking ribbon strip. Undo the other two screws and the top cover containing the entire scanner arrangement will lift up. There might have been weak clips? Whatever, it didn't present much of an obstacle. Again, don't be too forceful. The scanner connects to the motherboard by a ribbon strip. The printer, inside, is mostly empty. The motherboard is at the left rear of the machine. The big IC at the bottom is an NT5SV16M16CS-6K, which is 16MB arranged as 16 bit, or 32MB in total. The big square is the main SoC. It is marked 9E208057 and GW012 28 A. 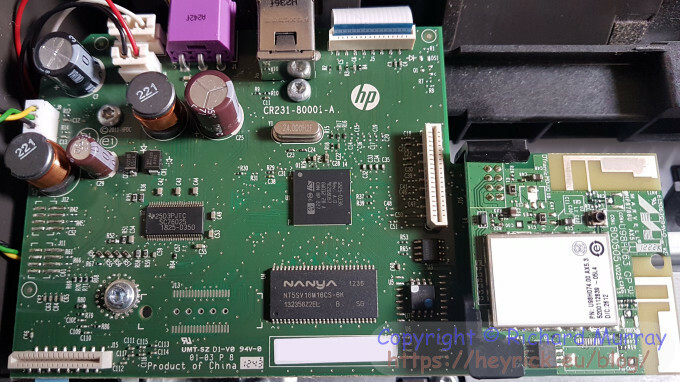 Being a custom part for HP, there's no information on this that I could see. The input clock is 24MHz. No idea what the internal processor type is, or how fast it runs. On the left is an SC76025. At a guess, I'd say this may be a DC/DC motor driver, possibly PWM? The SoC won't be driving the motors directly, so this is probably involved in driving them. There are no MOSFETs or anything like that on the board. Finally, there are three small ICs on the right of the motherboard. I can't make out the markings on them from the photo, so I'm guessing that one is some sort of NVRAM and the other is a serial FlashROM. The third? No idea. The WiFi support is a module that plugs in by way of an eight way connector. Somewhat astonishingly, it looks like the connector has four pins for ground, two for power, and two for data. I hope the data is some sort of USB and not... you know... serial! There's no obvious serial port for debugging, but there are five (five?!) suspicious looking holes to the left of the SRAM. It's a pretty simple arrangement, yet quite effective for its cheapness. 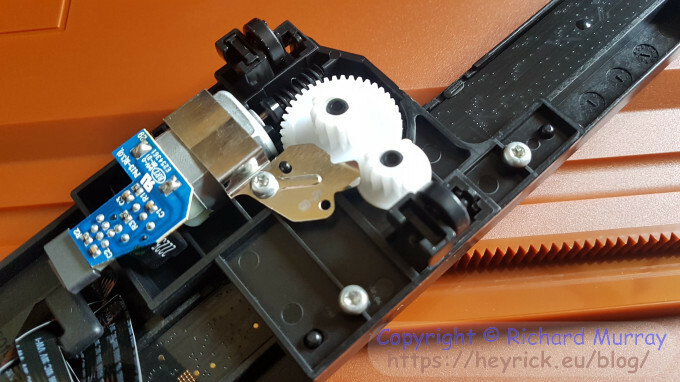 The motor drives a toothed cog that moves the scanner arm across the paper, and a snug fit with a second cog keeps everything aligned. The other side of the motor from the worm drive has a little plastic disc fitted. The disc has dark patches, and is placed in the view of an optosensor. I'm guessing from this that the motor is a cheap DC motor, not a stepper. That said, this arrangement claims to be capable of 1200dpi in both directions, though the built in webscan only wanted to offer 600dpi maximum. The scanner element is, as is common these days, a single strip of CCD sensors. Colour scanning is produced by switching from red to green to blue very rapidly (it will look white to you, unless you look at it and flick your sight around quickly in which case you might catch some of the colour changes). This method simplifies the design of scanners, it's simpler to switch bright LEDs and means only one sensor strip is necessary, plus there's no problem with alignment as it's the same strip doing all three colours. The only issue will be correction for the fact that a moving scanner (at any speed) is unlikely to see exactly the same thing with each colour. And, as you can see the simpler scanner arrangement is lighter so can be driven by a single motor. People who used scanners in the '90s might remember that they were complex beasts, often with belt drive and big motors. The main thing you'll probably remember is those fragile fluorescent tubes built into the scanning head that needed to 'warm up' to stabilise their colour temperature, and since it was 'white' the scanner needed to have three elements (one for each colour). Putting the printer back together is much the reverse of disassembly. Be careful with those ribbon things. They come out of their sockets too easily. The only complicated part is getting the plastic panel on the left (the part holding the display) back onto the printer. It clips on, but it's a tight fit. Just hold it in place and thump it hard. That'll do it. With the printer back together, here's a 300dpi scan scaled down to fit the blog aesthetic. It's a little light - the background is supposed to be black, but it was printed on shiny paper which might have been slightly reflective? It's easily enough fixed (though I have not done any processing other than a resize). The quality isn't bad for a cheap'n'cheerful printer. Screw you Hachette. PLUTO IS A PLANET. Has sufficient mass and gravity that it either has a moon, or ought to be capable of having a moon. Has sufficient mass and gravity that it is round. The first two planets - Mercury and Venus - do not have moons. Mercury is affected by the Sun's gravitational field, and Venus possibly had one that crashed into something else which caused it to fall out of orbit. But, hey, to make up for this, Jupiter has something like 79 moons. Pluto, interestingly, has the moon Charon that is about half the size of Pluto itself. 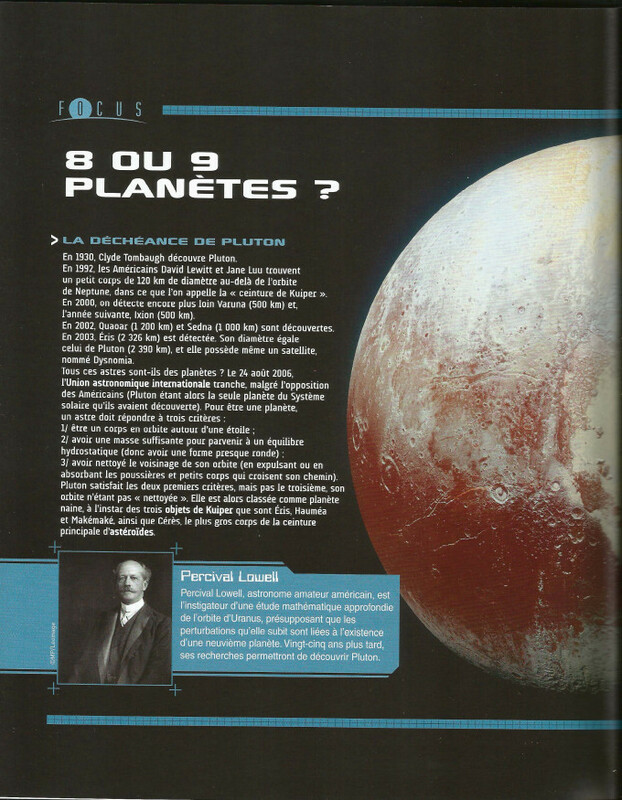 Because it is so big, it affects Pluto causing it to seem to orbit a point slightly outside of itself. However despite this wobble, Charon orbits Pluto and Pluto orbits the Sun. Hence Pluto is a planet and Charon is a moon. It seems in recent weeks that people are starting to agree that Pluto is, indeed, a planet. Anyway, we were talking about a printer, right? It's a simple low cost build where I'm quite sure the production is likely right to the margin of the retail price (what was it, about thirty quid? ), maybe a little more. A cost, clearly, intended to be recouped via printer ink. Speaking of which, with my printer I've printed just under 500 pages. Quite a few of them being images (onto plain paper) with five high resolution prints to photo paper. The plain paper prints tend to suffer from banding, however the photo prints are actually extraordinarily good for such a simple printer and a print head that only seems capable of two dots - heavy or light. My first set of Instant Ink is running around 2/5ths of the colour and a 2/3rds of the black. So I could probably print about 150-200 pages of pictures and stuff before the inks need to be replaced. Just shows what can be achieved by providing a big ink tank and filling it up. But, my god, when the Instant Ink box arrives, surely I must be holding in my hands the equivalent of €200 of unicorn tears? Anyway, if you ever wanted to know what's inside one of these things, there you go. A little board and... lots of empty space. So it printed 2840 pages in total with 2955 on plain paper and -151 on other paper. This is hysterically funny. I mean, exactly HOW HARD is it to increment a counter when a page gets spat out? And how rubbish is the firmware that it actually manages to arrive at a negative page count? Validation Are you real? Please type 40609 backwards.